The Batman Annual #1 from a while back already gave us chunks of this semi-origin story. That fact alone is a bit off putting, and this current Freeze focused issue has 2 writers. So in this issue we get 2 writer's writing two-thirds of a story. Two-thirds of a very predictable story I might add. While I applaud DC Comic's for taking a chance and revamping long time characters with the New 52, this is one I really think they've gone wrong with. All the beauty Paul Dini bestowed has been taken away and he's been relegated to another Arkham mental patient. Instead of having a sympathetic origin story with a perpetually frozen wife he can do nothing to save, he's an obsessive man and seeks to "preserve" his family. Just another lunatic with powers. They've lost the depth of this character in a poor attempt at gaining a new audience. The strange abandonment issues they've given to Freeze here are preposterous- Pappa Fries left and started a new family, and Momma Fries fell in a frozen lake and got brain damage- which Freeze views as abandoning him for some inexplicable reason. After a power out at Arkham Mr. Freeze escapes and tracks down his father who has already died by the time he gets there and he kind of steps into the family, which feels a bit too young for Freeze's age. One would think the new mother and children should be quite a bit older as his father probably didn't marry a child when he ran away years earlier. Really, DC has taken a very large step backwards with Victor Fries. There are already 2 other characters like this with Captain Cold and Killer Frost. And WHY ARE HIS ARMS SHOWING!!! A containment suit is useless if he has bare arms. And get rid of that stupid faux-hawk tuft of hair. Maybe they should've focused on preserving what made Mr. 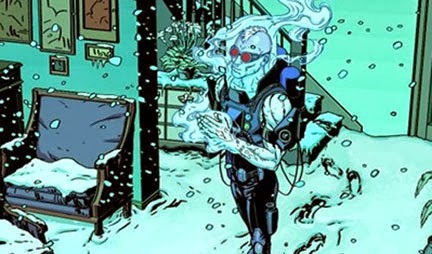 Freeze such a beloved villain in the first place. All-in-all it really feels like this was just kind of thrown together, that the writers didn't care- just another extra issue of something to fill an already over-loaded villains month. On a good note- I actually enjoy the interior art and colors. It lends a nice cool tone to the story. Although the cover by Guillem March is horrendous. Dear DC Comics, bring back the compelling Mr. Freeze.